Camy's Loft: Preorder A Dangerous Stage, the 2nd book in the Protection for Hire series! Preorder A Dangerous Stage, the 2nd book in the Protection for Hire series! 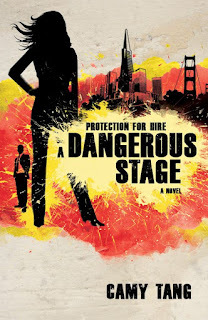 I didn’t notice until yesterday that book 2 in my Protection for Hire series, A Dangerous Stage, is now available for preorder! Isn’t that cover awesome? Zondervan’s art team ROCKS! Click here for info on book 1 in the series, Protection for Hire. That cover is on FIRE! I love it. Can't wait to read this one. Haha!!! You're right! I hope you enjoy this. I think this is the best book I've written so far. so cool! what a great cover and i'm totally looking forward to it (though i bet my hubby will read it before i do. le sigh...)! LOL Now that's a great hubby!